Kavremover is a free tool for removing Kaspersky Lab applications that cannot be removed completely using standard Windows tools. 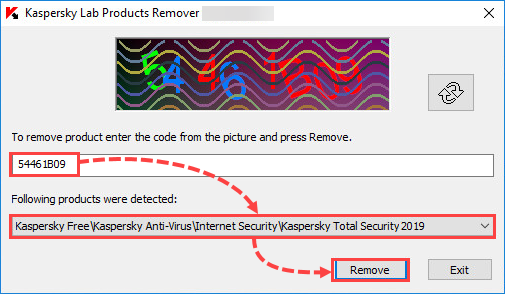 Do not use the kavremover tool unless recommended to do so by Kaspersky Lab technical support engineers. 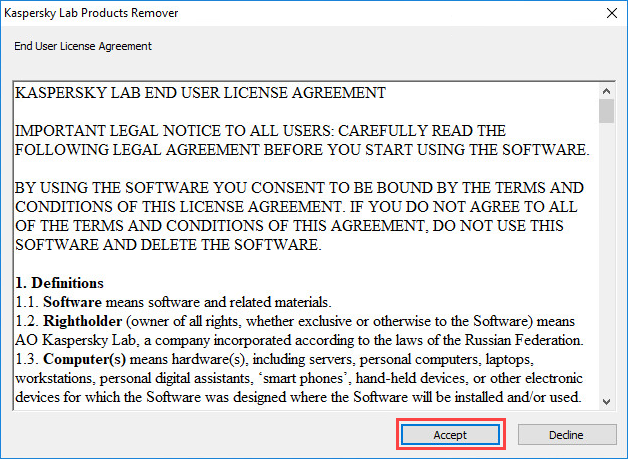 When you remove a Kaspersky Lab application using kavremover, license information is removed as well. Make sure you have the activation code or license key saved before using the tool. Download the kavremvr.exe executable file. Run the file once it has downloaded. Read through the End User License Agreement. Click Accept if you agree to the terms. Enter the security code from the image. If you can’t see the code clearly, click on the update icon to the right to generate a new one. Select the Kaspersky Lab application you wish to remove. Wait until you receive a notification that the application was successfully removed. The Kaspersky Lab application has been completely removed from your computer. If you have multiple Kaspersky Lab applications installed on your computer, remove them one at a time. Select the application from the list. FDE-encrypted drives (or drives scheduled to be FDE-encrypted) have been detected. Product removal is password-protected and the password was not specified in the command line. 1003 Related to all products. KAVRemover cannot be run from a directory whose path contains non-ASCII characters from a Windows localization other than the current one. This may happen if the username is in non-Latin characters and the user runs the tool from the Desktop. Removing the Network Agent from the Administration Server may render the server inoperable. The option to remove Network Agent has been removed from the new version of kavremover. You can use the kavremover tool only for uninstalling Kaspersky Lab applications from the devices running under Windows.